Poland's current account balance ended December with a deficit of €1152mn, wider than market expectations (€425mn). As a result, the 12-month current account/GDP ratio was neutral at 0% of GDP compared to a deficit of -0.6% in 2016. In 2018, we expect the external position to deteriorate, although the potential deficit should not exceed 0.5% of GDP. The trade balance fell into negative territory (deficit of €1268mn) as imports accelerated amid a recovery in investment. Official GUS data based on business reports provided evidence of a significant export drop to Eurozone countries. We see this as a temporary phenomenon (likely related to the lower number of working days after Christmas, which supported taking longer holiday leave). On an annual basis, the trade surplus shrank from €3bn in 2016 to €0.5bn (still above expectations at the beginning of 2017). 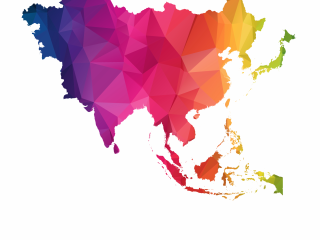 The strong performance of machinery and consumer electronics manufacturing (mainly focused on export), as well as the opening of new assembly lines in automotive, partially offset the increase in imports. Looking ahead, we expect the trade balance to deteriorate and fall into negative territory in 2018. 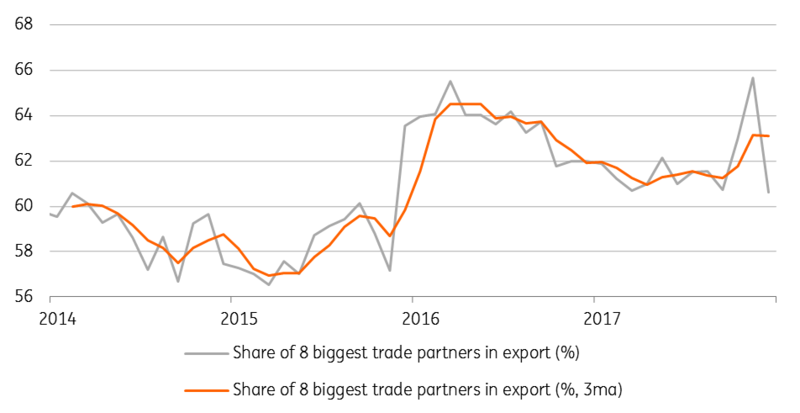 A structural improvement in production in the automotive and machinery sector is unlikely to offset the need for imports from infrastructure investment. Services accumulated a surplus of €1.6bn in December. On an annual basis, the positive balance on this account increased from €14bn in 2016 to €17.9bn. 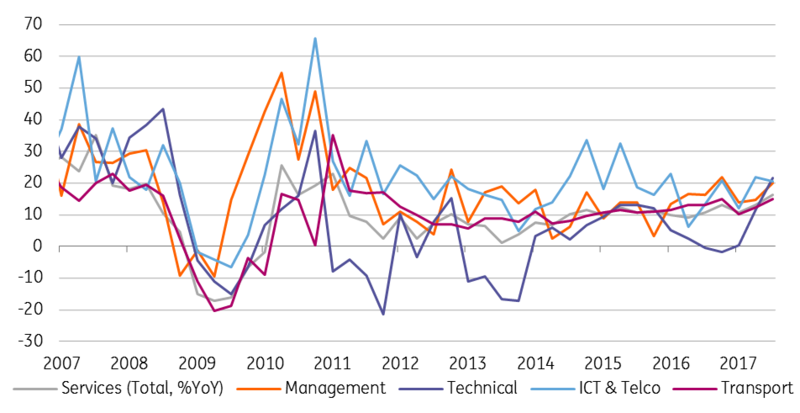 Eurostat data point to an expansion of technical services, ICT & telco and management positions (supported by the expanding number of shared services centres). Looking into 2018, we expect the surplus to increase further, albeit at a slower pace, as labour shortages limit the development of transportation and telecommunication services. The income deficit expanded further from -€16.9bn in 2016 to -€17.9bn last year. The significant inflow of migrants (MinLabor reported 900 thousand workers, mainly from Ukraine) resulted in a negative balance of compensation for employees (annual deficit of €2bn vs €0.1bn in 2016). 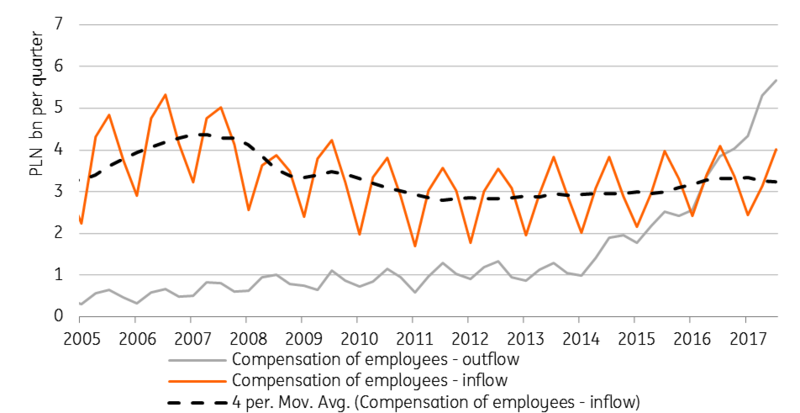 Among pure financial flows, changes were limited. In 2018, we expect the income deficit to widen even further as the number of economic migrants is likely to increase (again implying a negative balance of compensation of employees). Coupon payments are likely to decrease due to the Ministry of Finance's strategy of lowering the share of foreign investors in the public debt market.